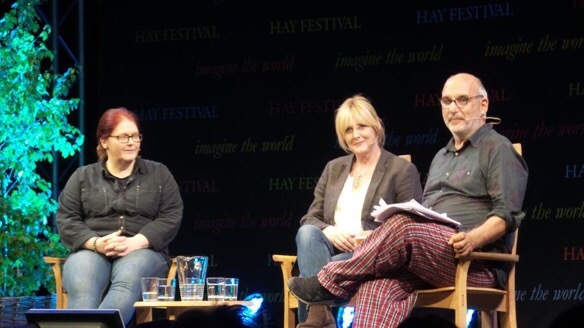 The Hay Festival assembled the writing and acting talent behind two of the top TV dramas of recent years; ‘Happy Valley’ and ‘Last Tango in Halifax’. Sally Wainwright reveals that ‘Last Tango in Halifax’ was actually her mother’s story. In Oxford, rather than the Yorkshire town where the series was set, she met and fell in love with a boy from school. The working title was ‘Anthony and Cleopatra’ but with Derek Jacobi on board there was concern that the audience would think it was Shakespeare. After the run throughs for the show, before filming, Sarah Lancashire got a call from her Director to tell her that Caroline, the character she was playing was gay. It seemed appropriate, on the day that Ireland has voted for gay marriage, to be discussing one of the most rounded gay central characters that has appeared on a prime time UK TV series. Wainwright gives some insight into the challenges of writing for TV. Writing characters and even dialogue can be easy, plots are where the real challenge lies. Tributes were paid by the whole ‘stage party’ to soaps and Coronation Street in particular, where both Sarah and Sally honed their talents. Sally revealed that she wrote ‘Happy Valley’ when she was given the green light to write whatever she wanted after the success of ‘Last Tango’. It was a kind of ‘Juliet Bravo’ for the 21st century. The lead role was witten for Sarah Lancashire, something that the actress said she found “very scary”. The insight for the role came from ‘Lisa’ a Greater Manchester Policewoman who happened to be an old school friend of Sally Wainwright, who this time directed, as well as wrote, the powerful psychological crime drama. Sarah played Catherine Cawood to absolute perfection as a woman wracked with grief & guilt over her daughter’s suicide and almost overwhelming & unrelenting rage at the man she held responsible for it all while trying to raise & love her grandson when most of the family shunned him. Only Sarah Lancashire could pull it all off with such fine precision. BRAVA!! The website event page mentioned this talk was palantyped. Does that mean a transcript is available somewhere? can we hear it on BBC Radio or BBCONE? Sorry I really don’t know. Will probably be available as an audio recording on the official Hay website at some point.